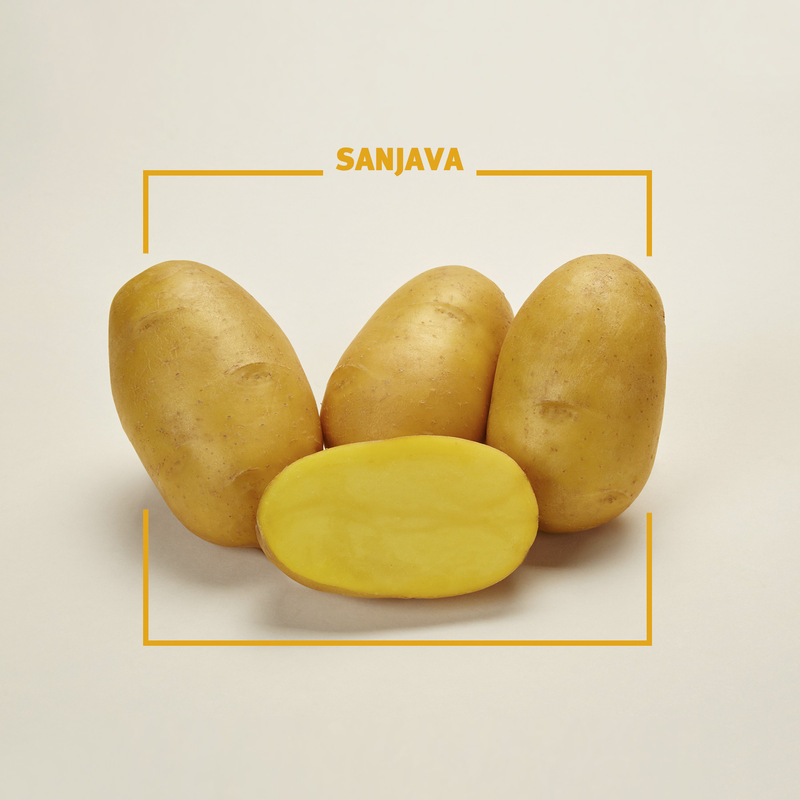 Sanjava is excellent suitable for packing. Cooking type B, excellent tasting quality, no discoloration after cooking, low sensitivity to mechanical storage, good storage ability, no internal defects, starch content 12 – 13%. High number of tubers, uniform medium sized grading, high marketable yield. Oval, very shallow eyes, yellow skin, yellow flesh. Medium tall, white flowers, rapid development. Prefers medium to high quality of soils with regular water supply; due to a good dormancy presprouting is recommended, planting in rows 32 – 34 cm, preventive chemical control of Rhizoctonia solani is recommended. Medium demand on Nitrogen (140 – 150 kg / ha) Potassium: 250 – 300 kg / ha Phosphorus: 100 kg / ha In dry years application of micronutrients via foliage. No sensitivity to Metribuzin, first chemical application against late blight should be in time; chemical, haulm killing together with a fungizide. Rapid skin finish, good dormancy, excellent suitable for long term storage.